From noon-6PM, on a picture-perfect home-town Mid-Western American Saturday afternoon, waves of Ohio citizens of every age, shape, color and size converged by RTA, Greyhound, car, bike and wheelchair on our PUBLIC Square - surrounding our people's Mayor Tom L. Johnson with love - to discuss politics, healthcare, economics and science... laugh, sing and dance... and march through the streets of downtown Cleveland in activist support for legalizing medical marijuana (MMJ) in Ohio, and across America. We 1,000 real Clevelanders marched through the streets of our home town, in solidarity, demanding jobs, peace and freedom for Ohio, and liberty for those suffering from government oppression and poor industrial healthcare in our community and America. Certainly, the mood was especially buoyant for MMJ patients and advocates in Cleveland this weekend, as MMJ advocates and the world now anticipate big, great things on the American civil liberties front from Ohio, as the world now knows Ohio's economy and healthcare are about to become the most "progressive" on Earth! Cleveland is, in fact, to be the capital of the brightest greenest state of Earth, as I like to say. 2011 is the year that Ohio MMJ patients and advocates marched through the streets of Cleveland, Ohio, knowing Peter Lewis has their back. Suddenly, it feels like the 73%+ of Ohioans who support legalizing MMJ in Ohio are nearing getting personal freedom, for the first time, for free. Sick people in Ohio, who should be prescribed MMJ, will soon have access to the best medicine, now illegal in Ohio... will have a get out of jail free card, for free. Peter Lewis is proposing to provide sufficient funding and other support to ensure medical marijuana will be legalized in Ohio by 2012, so all Ohioans may have a free ride to the better healthcare they want in Ohio. The 2011 Cleveland Medical Marijuana March showed Northeast Ohio moving to critical mass on some of the most important issues of our times... a movement of great minds collectively pushing forward Lewis' newly proclaimed mission to cooperatively legalize medical marijuana in Ohio, representing a true paradigm shift for Ohio to advance the cannabis economy here. For their efforts, Ohioans may soon be allowed by law to participate in important new green economies, thriving across America, bringing millions of Americans relief from serious illness and medical suffering. Ohioans will soon be protected from doctors profiting excessively by prescribing for patients the wrong medicines, and the sick will be protected from suffering at the hands of uncaring police and courts, which prosecute sick people for taking the best medication real science knows. Sick citizens will be protected from being locked-up in prisons like the Cleveland "Justice" Center, pictured at the mid-stage of our rally, below, simply for being more intelligent and honorable than politicians. For a good half-hour, these peaceful protesters circled the Justice center and brought love, hope and support to the many drug-war prisoners inside. Framed in Noguchi's "Portal", 100s of advocates for legalizing medical marijuana in Ohio marched around the Cleveland Justice Center Saturday, May 7, 2011, in a peaceful, orderly and intelligent protest of the arrest of 100,000s of Americans each year for possessing a safe, medicinal plant. The many victims of this US Federal government persecution, who are wasting away - at taxpayer expense - in the prison overlooking this rally, certainly appreciated the showing of community concern for their plight. Plant Kingdom hemp entrepreneur and culinary genius Jeremy Koosed says "We Won't Forsake Nature"
All that organizers, patients and advocates for MMJ ask of citizens, to jump-start a new multi-billion-dollar green economy and bring relief for the suffering here, is that the 73%+ who support legalization of MMJ in Ohio make certain they are registered to vote... and sign a petition to legalize MMJ in Ohio, when it is time... and vote to legalize MMJ, when it is time. In preparation for the legalization of MMJ in Ohio, citizens would be wise to learn as much as they may about MMJ and how it may help them, if they suffer from physical conditions best treated with MMJ, like Post Traumatic Stress Disorder, wasting, and chronic pain. Start speaking with your healthcare providers about MMJ... and find new healthcare providers who understand MMJ, if your current physicians are ignorant on the subject. If you are entrepreneurial, or are involved in regional healthcare, economic development, real estate, education, justice, or just about any other facet of society, you should seriously reflect upon the impact legalizing MMJ will have here, on your community and career. 10,000s of new jobs will be created here - neighborhoods will be transformed - landmarks will be saved and reused - our conversations will all change. If you do a bit of thinking and research for yourself, you will learn Reefer Madness was a bad petroleum and paper industry propaganda film from the 1930s, and that marijuana was actually outlawed to shut down the hemp industries, so Americans would become addicted to oil, as occurred. Hemp, which is related to marijuana, produces perfect foods and perfect biofuel, which is a superior way to power a car and America than poisonous oil. Oil producers hate hemp. Blame DuPont and Hearst for a near-century of pollution, death, imprisonment, ignorance and social harm against all Americans, since the 1930s... and thank today's intelligent-activist generations of MMJ and hemp scientists and advocates for setting you free of the worst of US American government corruption and stupidity in our long, dubious industrial history. Now, the next generations of industrialists need hemp... and will make fortunes from that, as well. This right may help compensate for past wrongs. As I highlight below, from a study about criminal injustice in Northeast Ohio: "those areas that have the highest percentages of African-Americans are especially likely to be subject to police surveillance and arrests" for drug possession, leading to poorer treatment and accommodation of proportionately more blacks than whites in our inferior quality-of-life prisons. 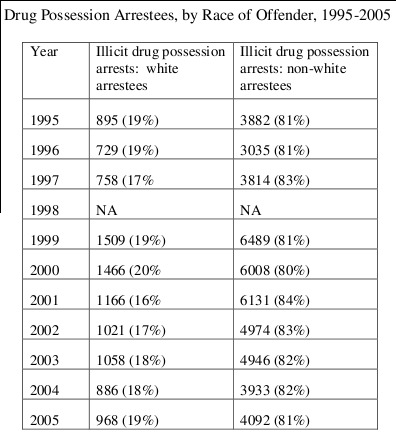 "Of those drug possession cases in which the race of arrestee is known within Cleveland city limits, as Table 1 below illustrates, there has been a consistent magnitude of over-representation of non-whites among drug possession arrestees over the past 10 years." Dare to think for yourself about your health, justice, nature and industry, from a position of freedom, with understanding of facts. To me, the 2011 Cleveland Medical Marijuana Rally demonstrated this movement is truly sincere in its commitment to issues of medical patients' rights - healthcare, science, economics and suffering are the topics of debate among these Clevelanders. All of the citizens I spoke with at the rally have personal or family health tragedies to deal with in life, and so are intimately concerned about the legality and safety of the world's best medication. The rally was packed with veterans, moms, dads, grandparents, and their familes - suffering people - who are mostly white, suburban, middle-class working stiffs with disabilities, just like I reported finding at KushCon2, in Denver, last December. The only difference between MMJ advocates here and in Denver is that freedom-loving Coloradoans already succeeded legalizing MMJ there, so they have better healthcare there than here, and citizens may prosper from that, while Ohio MMJ patients may go to jail for using the best science for their health, ruining their lives in many ways, forever. Northeast Ohio Medical Marijuana patients and advocates took to the streets to bring visibility and awareness to the injustice of the "war" against medical marijuana in some parts of America, like Ohio - and at the US Federal level - shown here in front of the Cleveland Courthouse. This MMJ rally comes less than a week after the world's greatest financial supporter of MMJ legalization - Peter Lewis - offered to fund a campaign to legalized MMJ in Ohio. Ohio has the 8th largest economy in America. At nearly $500 billion, our Gross Domestic Product is almost twice that of Colorado, and our population is more than 2X... meaning we are at least twice the market for MMJ, and should be in the top 10 states in economic benefits from the industry. Ohio should prosper from this green movement way beyond #19 Colorado or #38 New Mexico, which are developing thriving shares of America's near-$2 billion in legal cannabis economies. We are an agricultural, healthcare, industrial and education powerhouse and we - Ohio - must now take our rightful place in the global cannabis economies. Ohioans must stand up for their civil rights, and for Ohio patient rights, by supporting the cannabis economy here at home.